The Chinese New Year in 2019 occurs on February 5th. In terms of the 60 Year Cycle, this is a year, the Year of the Pig, , and the year of yin earth, . The Chinese New Year is defined as the second New Moon after the Winter Solstice. This rule has been used since the T'ai-ch'u Era (104 BC) of the Emperor Wu Ti (141- 87 BC) of the Former Han Dynasty. Since the "Year of Pig" doesn't sound very nice to some people, is often rendered "Boar" instead, which sounds like a wild animal rather than the barnyard. However, the primary meaning of both and is "pig" or "hog." At least "pig" sounds cuter than "hog." But for "boar" we need a binome, like , which looks like the "duke" pig. We do think of boars as larger and meaner. Thus, since nothing of the sort had been used during actual Chinese history, the editors of the Almanac have obviously decided not to use it. When the Almanac gave such a date, if we brought it up to 2019, the year would be 4656. Currently, various sources on line, many of which seem to be Chinese, give a date for 2019 as 4717. So we want to ask what these implied Eras actually date. The number 4717 would mean a benchmark of 2698 BC, while 4656 implies one of 2637 BC. Since these differ by just 61 years, it looks to be an issue of just one 60 year calendar cycle. Then, if we consult the Dynasties listed at the end of Mathew's Chinese Dictionary [Harvard University Press, 1972, p.1186], 2698 looks like beginning of the reign of the Third Legendary Emperor, the "Yellow Emperor," , in 2697 BC. The difference between 2698 and 2697, one year, like the one extra year in the 61 years just noted, bespeaks some confusion or conflict between cardinal and ordinal counting, such as we have in reckoning the beginning of the century and the millennium. Chinese practice involves its own problems, when a reign era proclaimed by an Emperor, or at his accession, only actually begins the following year. This plays havoc in Chinese historiography with short reigns, which may not make it to the next year, as under the Ch'in (the three days of Hsiao-wên Wang) and the Mongols. I still have not seen a full and sensible explanation of such problems. So the continuous Chinese Era dates what apparently is taken as the beginning of Chinese history, with the legendary "Yellow Emperor," . However, we see in Mathew's that the Yellow Emperor does not seem to actually begin Chinese History. The beginning of the entire "Legendary Period" of the "Five Emperors" was in 2852 BC, 155 years earlier, with T'ai-hao, . The complication is that there have been handed down different versions of who the Five Legendary Emperors were. It is the "Grand Historian," Szu-ma Ch'ien [Sima Qian] (145-86 BC), who lists the "Yellow Emperor" first among the five. Other sources, like the I Ching, are what Mathew's follows in making the "Yellow Emperor" third and T'ai-hao, , first. The dates given by Mathew's, however, apparently match what is used by those who place the "Yellow Emperor" first. Were we to use the earlier date for T'ai-hao, the year for 2019 would be 4871, which I have seen given by no one [note]. The Japanese no longer use the Chinese calendar; but Japan still dates by reign eras, where 2019 is Heisei, , year 31, the Era of the Emperor Akihito. The Emperor may abdicate this year, and a new reign Era will be adopted. Japan does not follow the Chinese practice with eras, so, if the Emperor abdicates, Heisei 31 will become year 1 of the next Era. And Japan does use a continuous Era of its history, making 2019 year 2679, since the legendary Emperor Jimmu in 660 BC. This dating is seen less often, since it may be associated with the bad old days of Japanese imperialism and the Shintô Cult of the Emperor. But one should be familiar with it. The "Type Zero" World War II Japanese Naval fighter got its name from becoming operational in the year 2600 (= 1940 AD). Chinese astronomy divides the year into twenty-four parts ("fortnights"), based on the longitude of the sun on the ecliptic. These are called the "Solar Terms," or the , the "Twenty-Four Periods of Ch'i" (where ch'i, , is the "breath" or vital energy of the body, but also simply air, steam, or weather). As recounted in " Groundhog Day and Chinese Astronomy", the Chinese seasons begin at the midpoints between the solstices and equinoxes, not at the solstices and equinoxes themselves. The rule for the Chinese New Year, from the T'ai-ch'u Era, may seem odd. Why this New Moon? Well, it turns out that this will be the closest New Moon to the beginning of Spring on 3/4 February, the Solar Term "Spring Begins." Since a lunar (synodic) month is 29.5 days long, the second New Moon after the Winter Solstice is not going to occur before about 20 January, or later than about 19 February. That puts 3/4 February squarely in the middle of the range. The Chinese reckoning of the seasons is different from what we see in Western astronomy, from the Babylonians, to the Greeks, to the Romans, although there are clues that the ancient Celts, and others, may have seen things the way the Chinese did [note]. The twelve parts of the year corresponding to the signs of the Zodiac each consists of two Solar Terms, but four Zodiacal periods overlap two Chinese seasons. The seasons are of different lengths because, according to Kepler's Second Law, the Earth travels faster the closer it is to the Sun. Between January 2 and 4, the Earth reaches Perihelion, its closest approach to the sun, and travels the fastest. Thus, Chinese winter is only 89 days long, while Summer is (roughly) 94 days long. These are bigger differences than in the Western seasons because all the shortest days of the year (in the Northern Hemisphere) are in Chinese Winter, while all the corresponding longest days are in Chinese summer. The shortest days of the year are evenly divided between Autumn and Winter in Western reckoning. The Chinese New Year is often called the "lunar" new year, but it is no more "lunar" than the Babylonian, Jewish, or Islamic new years, which are also based on lunar months. Like the Babylonian and Jewish calendars, the Chinese is "luni-solar," with lunar months adjusted with intercalations for the solar year -- seven months added every nineteen years. The Vietnamese new year, Tet, is often also identified as "the lunar new year," but it is, indeed, just the Chinese New Year. A reluctance to identify it as such, in the days of the War in Vietnam, may have been from ignorance, Vietnamese nationalism, or nationalism imputed by American reporters. The Chinese calendar has similarly been used in Korea, Japan, and Mongolia [note]. Another confusion about the Chinese New Year is the phrase gung hay fat choi, which is often said to be "Happy New Year!" in Chinese. In 2004 I actually saw a news report that this was the right phrase in Mandarin Chinese. But it is not. It is in one of the other Chinese languages (or "dialects"), or Cantonese, which is spoken in Guandong Province and Hong Kong. Cantonese syllables can end in m, t, p, or k, while Mandarin syllables cannot. The word fat thus shows that the phrase cannot be Mandarin. The currency of the Cantonese expression is probably due to the circumstance that most Chinese immigrants to the United States before World War II were from Guandong Province, with Hong Kong itself contributing its influence (especially with a large movie industry) since then. The same phrase in Mandarin is . This does not literally mean "Happy New Year," but is a wish for complete happiness and prosperity. A web page on line says that gung hay fat choi is not used by anyone in China, and that it is the result of Imperialism. Unfortunately, this would mean that no one in China speaks Cantonese anymore, and in fact there is a 1985 movie, in Cantonese, called Kung Hei Fat Choy. The only "Imperialism" here may be the program of the Chinese Government to suppress local languages. Ch'ing Ming, , "Clear and Bright," contains a major spring festival, used to visit the family tombs, to clean them up, venerate the ancestors, and have a picnic. This practice is called , "sacrifice [and] sweep," although the "sacrifice" these days is mostly burning incense and paper money. Ch'ing Ming also happen to be the names of the last two Chinese Imperial Dynasties, the Ming (1368-1644) and the Ch'ing (1644-1912), chosen for their auspicious associations. The term "White Dew," , whose Japanese on reading (i.e. with the words borrowed from Chinese) is Hakuro, also figures in its kun reading (i.e. with Japanese words), Shiratsuyu, as the name of a Japanese World War II destroyer. Since length of all terms may vary slightly from year to year, all dates may occur a day earlier. Calculations of New Moons are based on the meridian 120o East. The Winter Solstice (term P-11) always falls in the 11th Month. In an intercalary year, a month in which there is no Principal Term is the intercalary month. It is assigned the number of the preceding month, with the further designation of intercalary. If two months contain no Principal Term, only the first such month after the Winter Solstice is considered intercalary. These rules, which may be found in the Explanatory Supplement to the Astronomical Almanac [prepared by The Nautical Almanac Office, U.S. Naval Observatory, edited by P. Kenneth Seidelmann, University Science Books, Mill Valley, California, 1992, p.596], do not provide a simple means for amateurs to construct a Chinese calendar. This was always done by Court Astronomers and still calls for precise astronomical data and special calculations, though it should be reliable enough to use the data for New Moons and for the ecliptic longitude of of the sun in The Astronomical Almanac for the year in question [U.S. Government Printing Office, Washington, and Her Majesty's Stationery Office, London]. A table with the Chinese characters for all the Solar Terms may be found in Mathews' Chinese-English Dictionary [Harvard University Press, 1972], p. 1178. My original information about the Chinese calendar was from O.L. Harvey's pamphlet, "The Chinese Calendar and the Julian Day Number" , which was based on Chronological Tables of Chinese History, by Tung Tso-pin [Hong Kong University Press, 1960], a rare work that I have never examined independently. The locus classicus for Chinese astronomy may be Joseph Needham, Science & Civilisation in China, Volume III, Mathematics and the Sciences of the Heavens and the Earth [Cambridge U. Press, 1959, 2005]. Curiously, the history of the Chinese calendar at one point becomes mixed with that of the Western astronomy. This was because Matteo Ricci (1552-1610), a student of Christopher Clavius (1537-1612) -- the Papal astronomer responsible for the Gregorian calendar reform of 1582 -- was sent to China by the Jesuit Order in that very year. Ricci was permitted to travel to Peking in 1596, and then in 1601 presented a mechanical clock to the Emperor and was allowed to appear at Court. 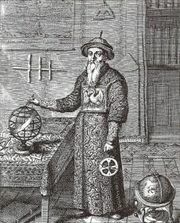 Ricci, who soon became impressively learned in the Chinese language and literature, was able to introduce Western theoretical and technical astronomy to China. This was, unfortunately, Ptolemaic rather than Copernican astronomy, but it nevertheless included methods that were better than had been used in China. This created a position of influence for the Jesuits at the Imperial Court that lasted from the Ming into the 19th century, with a steady stream of inventions like the telescope and even Copernican ideas following in their wake. Indeed, in 1611, the Jesuits were charged with reforming the calendar. There was considerable resistance to this from the Chinese astronomers and matters were delayed, but the Imperial order was renewed in 1629. This Jesuit influence was continued into the Manchu Ch'ing Dynasty. The political opposition to this perhaps reached a peak in the time of Johann Adam Schall von Bell (1591-1666), who was given charge of the Jesuit mission in 1630. In 1644, Schall and the other Jesuits were arrested for treason and imprisoned. In 1665 Schall was condemned to death. However, this judgment was soon revoked and the position of Schall (soon to pass away naturally) and the Jesuits restored. In 1669, in the time of Father Ferdinand Verbiest (1623�1688), the Manchu K'ang-Hsi Emperor again renewed the charge of the Jesuits with reforming the calendar and even ordered a belated official funeral, with an Imperial Inscription, for Father Schall. Even when Christianity was prohibited in China in 1724, the Jesuits were retained at Court. 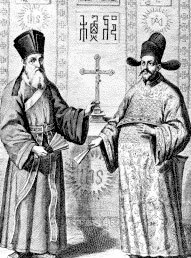 Thus, as noted, since the Chinese calendar is governed, not by the simple rules of the Julian or Gregorian calendars, but by the astronomical determination of New Moons, this process came under the influence of the Jesuits and of Western astronomy. This influence may be said to have continued until today, since Western astronomy has grown into the modern international science. I have seen preciously little information or even lore about T'ai-hao, . Although Mathew's Chinese Dictionary lists him first of the Five Legendary Emperors, there is not an entry for his name in the body of the dictionary. Similarly, there is no entry under his name in the ABC Chinese-English Comprehensive Dictionary, by John DeFrancis [Hawai'i, 2003]. In Mathew's, the character [#2072] is defined as "Clear summer sky. Vast; grand. The Power that rules in the heavens." The combinations of interest are , "the vast heavens; Imperial Heaven -- it seems to be used both of the heavens in their expanse, and of Heaven as having a ruling personality"; and , "The Sovereign on high in the vast heavens." Remembering that originally would mean a "god," this makes a fairly serious deity -- serious enough that it is curious we don't hear more about him. Given the superlatives but little information about T'ai-hao, it is then also curious that the Five Legendary Emperors often also include Shao-hao, , which would mean the "lesser," as opposed to the great, "Sovereign on high." We find him in various lists in various places, once even as the first Emperor, in others as the son and/or successor to the "Yellow Emperor," whether the "Yellow Emperor" is listed first or third (as on Mathew's list) -- yet he does not figure at all in the lists of Szu-ma Chien or the I Ching. The lore about Shao-hao is varied and contradictory, and he has even entered the universe of modern computer gaming. All the greater the contrast with T'ai-hao. For instance, in 2015, the Chinese New Year, for the year, fell on February 19th, fifteen days after Spring Begins on February 4 (and, as luck would have it, two days after Mardi Gras). This appears to violate the rule for the occurrence of the Chinese New Year, which is the second New Moon after the Winter Solstice. The Winter Solstice in 2014 was on December 21st at 23h02m, followed by a New Moon on December 22nd at 01h36m, on Greenwich Mean Time (GMT; Universal Time, UT; or Coordinated Universal Time). Subsequent New Moons in 2015 are on January 20th at 13h14m and February 18th at 23h47m. I have had one Mongolian correspondent claiming that Chinese astronomy, attested from antiquity, was derived from the Mongols. Since the Mongols adopted writing only in the time of Chinggiz Khan, and so Chinese civilization antedates any Mongolian documents by a couple of thousand years, I don't think there is much doubt, from the historical evidence, that Chinese astronomy originated in China. This sort of thing must be added to the list of nationalistic and propriety claims made by various ethnic groups, countries, or even races. We might be surprised at claims for the antiquity of Mongolia despite the total lack of evidence, but that sort of thing is not unusual in the genre. Chinese years are classified according to 10 "Heavenly Stems" and 12 "Earthly Branches." The succession of Stems and Branches produces a sixty year calendar cycle. The Earthly Branches are more familiar, since one association is with 12 Zodiacal animals, which in Buddhist tradition are supposed to be the animals that responded when the Buddha called to them, like St. Francis, to hear him preach the Dharma. Most people hear about the Chinese New Year and know, for a while, that a year like 2000 is the "Year of the Dragon." The Chinese names, in Pinyin, in the lefthand column are not the names of animals, but the proper names of the "Branches." The Japanese list gives the Japanese pronunciation of the Chinese name followed by the Japanese name of the corresponding animal. The Vietnamese names are the Vietnamese pronuncation of the Chinese names. The Mongolian names are the animal names. Thus, tora in Japanese and bars in Mongolian both actually mean "tiger." Since the "Year of Pig," like 2019, doesn't sound very nice to some people, is often rendered "Boar" instead, which sounds like a wild animal rather than the barnyard. However, the primary meaning of both and is "pig" or "hog." At least "pig" sounds cuter than "hog" -- some people have them as pets. But for "boar" we need a binome, like , which looks like the "duke" pig. We do think of boars as larger and meaner -- and certainly not domesticated. The "Year of the Rat" may sound even less appealing than "Pig," but there doesn't seem to be a remedy for it. The only actual mythological creature here is the Dragon, whose years are the most auspicious. The primary association of the Heavenly Stems is with the five elements. These are divided into yang or "elder brother" and yin or "younger brother" forms. The Chinese names are not the element names, but the proper names of the "Stems." Note that these figure as the second element in the names of the Kings of the Shang Dynasty. The Japanese and Mongolian lists give their pronunciation of the Chinese names followed by the elder/younger version of the element names. The Vietnamese list is just the pronunciation of the Chinese names. A table with the Chinese characters for all the Earthy Branches and Celestial Stems may be found in Mathews' Chinese-English Dictionary [Harvard University Press, 1972], p. 1176. Treatments of the Japanese Branches and Stems, and other calendar features, may be found in the Historical and Geographical Dictionary of Japan, E. Papinot [Charles E. Tuttle Company, 1910, 1972], p. 836, and in The Princeton Companion to Classical Japanese Literature, Earl Miner, Hiroko Odagiri, and Robert E. Morrell [Princeton University Press, 1985], p. 399. The Vietnamese names here are taken from Nguyên Ðình-Hoà's Vietnamese-English Dictionary [Charles E. Tuttle Company, 1966, 1991], under listings for chi (the Earthly Branches, p. 62) and can (the Heavenly Stems, p. 31). Vietnamese diacritics cannot be rendered precisely in HTML.